Dodgy puppet or European geopolitical timebomb? Jed-ography or the Geography of Jedward? 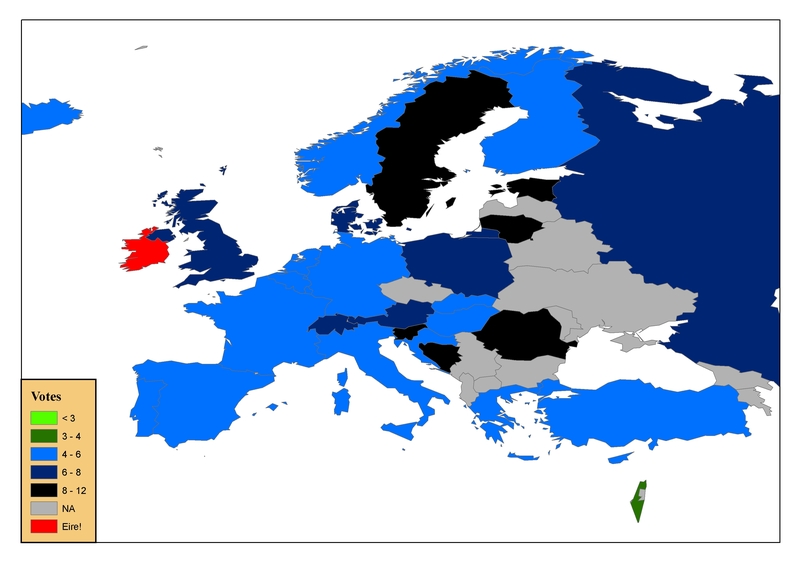 Where does Ireland win its Eurovision Song Contest points from? In the mid-1990s the Irish were the undoubted kingpins of the Eurovision Song Contest. Starting in 1992, Ireland had enjoyed an unprecedented run of success in the contest. Between 1992 and 1996 Ireland would win the contest on four occasions (including a three in a row between 1992 and 1994); even in the year (1995) Ireland did not win the contest the winning act from Norway was to feature an Irish performer (Fionnuala Sherry) in a leading role. The winning run came to an end in 1997, but even in that year the Irish representative, Marc Roberts, would finish comfortably in second place. It seemed then as if it would be just a question of when, not if, Eurovision would be returning to Ireland. Average points to Ireland from countries in Eurovisions between 1975 and 1997 (during the jury-voting era). Israel emerges distinctively as Ireland’s least enthusiastic supporter based on these figures. Between 1997 and 2010 however, Ireland’s Eurovision fortunes fell decidedly into decline. While Ireland, between 1975 and 1997, had earned an average of 130 points per contest (averaged out on basis of what scores would be with 25 countries taking part/voting in each contest – maximum possible tally would be 288 points), with this average increasing to 169 points during Ireland’s glory days of the mid 1990s, Ireland’s average point tally has fallen to just 39 points per contest over the contests held during the 1998-2010 period. Between 1992 and 1997, Irish entries were awarded douze points (maximum number of points awarded by different participating countries) on 26 occasions, getting the “12″ from 3 different countries in 1992 (Linda Martin), 7 in 1993 (Niamh Kavanagh! ), 8 in 1994 (Paul Harrington and Charlie McGettigan), 0 in 1995 (Eddie Friel), 7 in 1996 (Eimear Quinn) and 1 in 1997 (Marc Roberts). Between the late 1990s and 2010, however, Irish entries were awarded the coveted douze points on only four different occasions, getting a “12″ from Lithuania in 1999 and from Switzerland in the 2010 semi-final, and also getting “12″s from our nearest neighbour, the UK, in 2003 (Mickey Joe Harte) and the 2005 semi-final (the McCauls). 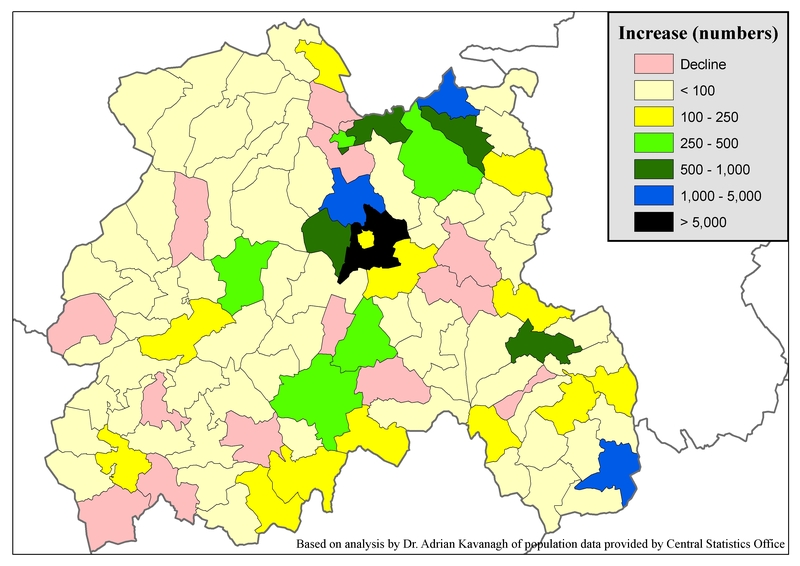 What was also evident was how Ireland’s vote patterns (that is, when we did win significant number of points) became decidedly more geographical in the noughties, as indeed was the case for most other participating Eurovision countries. 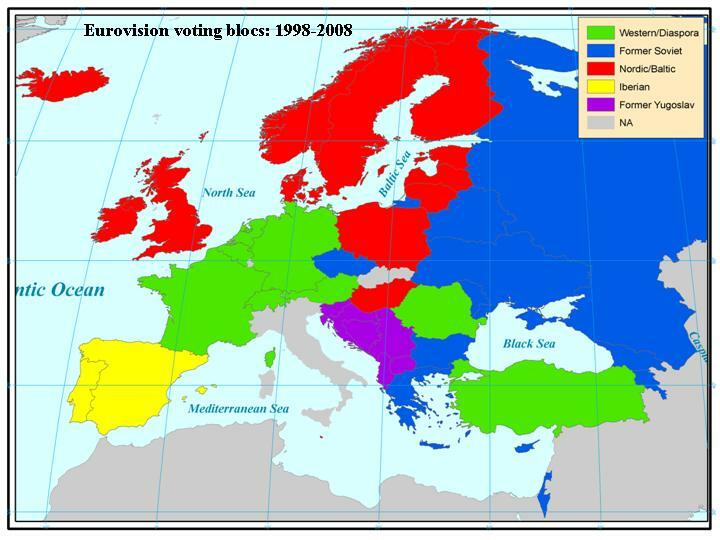 While Ireland was the Fianna Fail of Eurovision in the 1980s and especially the early-to-mid 1990s – with a catch all pattern of support and an ability to win votes from all the participating Eurovision states (as the map above shows), in the 2000s Ireland tended to be dependent on support from a small number of countries located mainly in Scandinavia and the Baltic region – namely the Nordic Bloc countries – as well as some other “traditional” or “old Eurovision” countries such as Malta and Switzerland. 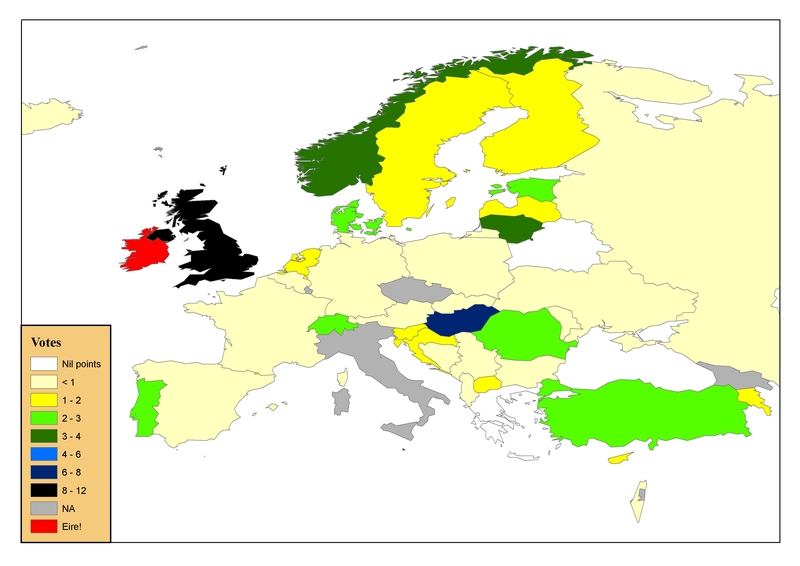 Average votes won by Irish entries at Eurovisions between 1998 and 2006. Much of the continent effectively was a Eurovision desert, with few, or no, points are being won from many of these countries. During the televote era, Ireland has failed to win any Eurovision points from Greece, Belarus and Georgia, as well as Italy and San Marino, although the latter two countries have had fewer opportunities to vote for Irish entries given that since 1998 there has been only one Italian entry and two San Marinese entries taking part in the competition. Ireland’s Eurovision fortunes have taken a decided turn for the better as we move out from the noughties and into the tenties or teenties. 2010 marked the first time an Irish entry had managed to qualify out of a Eurovision semi-final since Brian Kennedy’s success in the 2006 contest in Athens, although a United Kingdom douze points was needed to get Niamh Kavanagh out of what was probably the toughest and most competitive semi-final in Eurovision history. In 2011, Jedward also managed to make it out of their semi-final by a relatively narrow margin, but this time without being able to rely on a friends and neighbours vote from the United Kingdom as that country was not voting in Ireland’s semi-final as indeed will be the case again in the 2012 contest. Niamh Kavanagh’s geography of support was very much focused on the “old Eurovision” countries, earning her stronger points tallies from countries such as Switzerland, Norway and Israel which subsequently went on not to award points to Jedward in the 2011 contest. Just like Niamh Kavanagh in 2010, Jedward won relatively few points from the “new” Eurovision countries in the eastern part of Eurovision-land even though they went on to attain a Top 10 finish in the Final. 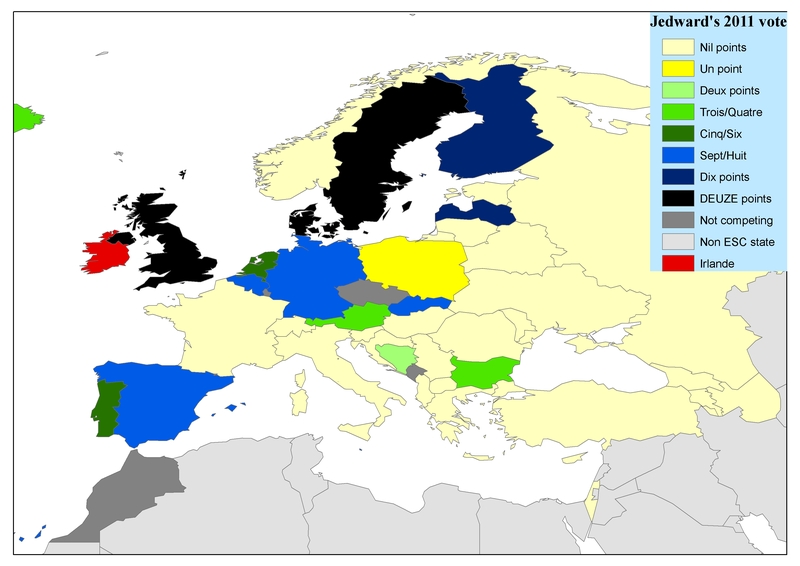 Jed-ography: the geography of Jedward’s support patterns in the 2011 Eurovision final. While Jedward picked up big points from a number of north-western European countries, they struggled to win points from southern and eastern European states. 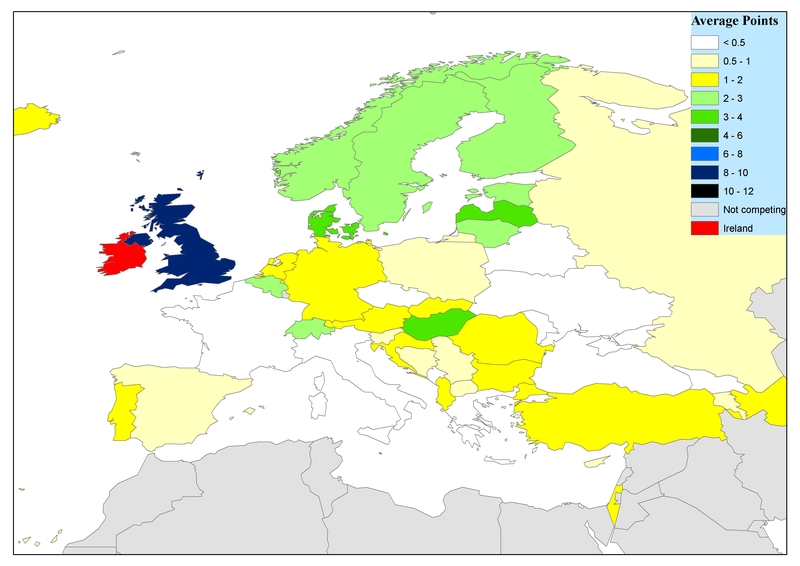 The geography of Jedward in the 2011 Eurovision contest was very north-west in its focus, albeit with a significant outlier in the Iberian peninsula, with their biggest points coming from countries in the Nordic Bloc and other western countries located close to this region, such as Germany, the Netherland and Belgium – other more southerly western countries proved to be less generous, most notably the returning Italians but also the French. While significant Jedward points were associated with the countries clustered in the north-western part of the continent, relatively few points were won by Ireland by countries outside of this region and in particular in the more southern and eastern parts of the continent, with the notable exception of the Iberian countries. The problem with such concentrated vote patterns and with an over-reliance on a small number of countries for support, or Eurovision points, is two-fold. First of all, this relatively small number of Eurovision-supporting countries becomes an even smaller number when it is split between two different semi-finals and means that the maximum number of points Jedward can expect to win – in the expectation of higher points offerings from the Nordic and north-western countries but relatively few points from southern and eastern Eurovision countries – will tend to be not much bigger than the minimum number of points required to edge Ireland into the qualifying places in a semi-final, even allowing for favourable televote support trends. 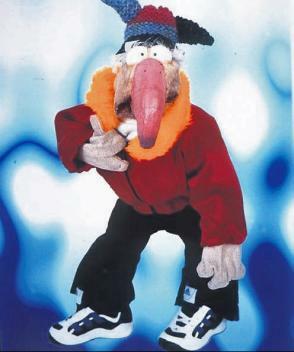 Secondly, it places a lid on Ireland’s Eurovision ambitions. Ireland can again hope for a Top 10 finish in the Final, if Jedward qualify and if the votes from Jedward’s Europe prove as favourable as they were in 2011, but they cannot hope to win if those parts of Eurovision-land that have been a virtual Eurovision-points desert in the 2000s remain so in the 2012 contest. Ultimately, the road to Eurovision victory for Jedward must run in such a way that it encompassed the countries located to the east of the Elbe and the Danube. 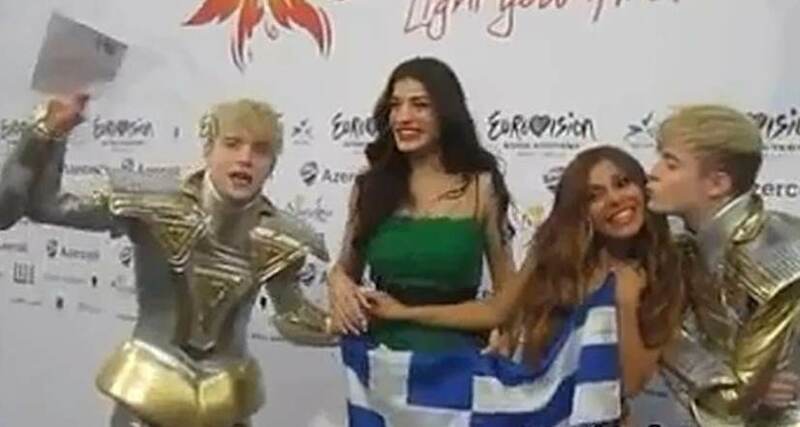 To use good old elections parlance, Jedward need to be picking up at least the “lower preferences” (or, in other words, the 3, 4, 5 or 6 points tallies) from countries such as Moldova, Montenegro and Macedonia if we are to seriously entertain the prospect of an eight Irish Eurovision victory and Portlaoise 2013.